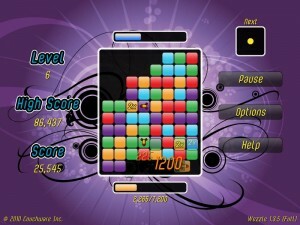 Wezzle is described by its makers, Couchware Inc. as, “an indie puzzle game featuring strategic items, pumpin’ music and eye-poppingly colourful graphics.” In all honesty I loaded it expecting another rehash of the familiar match-3 type games, but was actually very pleasantly surprised by the implementation. Imagine a mix of Tetris (in reverse), Popcap’s Bejeweled and MindJolt’s Facebook hit, CubeCrash. Throw in some special items, achievements, and catchy music and you’ve got a recipe for Wezzle. It’s a charmingly presented twist to the familiar genre, in which you must make matches of 3 or more in a row by destroying other blocks, which causes the remaining blocks to fall or slide into each other to create your matches. The twist is that the shape of the “remover” changes, and you will destroy between one and three blocks in a different configuration each time. Like the classic Tetris, you can see a preview box in the top right of the screen which lets you know the shape of the upcoming remover. This can also be turned off for an additional challenge. You are also able to rotate the remover but as your level increases, the time you get to make a move rapidly gets shorter. If you run out of time (denoted by the blue bar at the top of the screen) the AI will make a move for you. 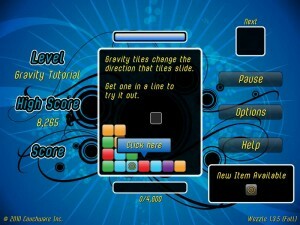 Each time you make a move, new blocks will fall from the top and once the screen is full, it’s game over. You’re able to choose from three difficulty settings so you can either take it nice and relaxed, or really challenge yourself. Another feature that will keep you playing is the achievements. It’s always nice to see indie devs implementing the now fairly standard achievement system as it definitely adds to the replay value. Overall, the graphics and audio are very polished, and Wezzle even lets you pick from three different soundtracks which is a thoughtful little feature and adds to the professional feel of the game. 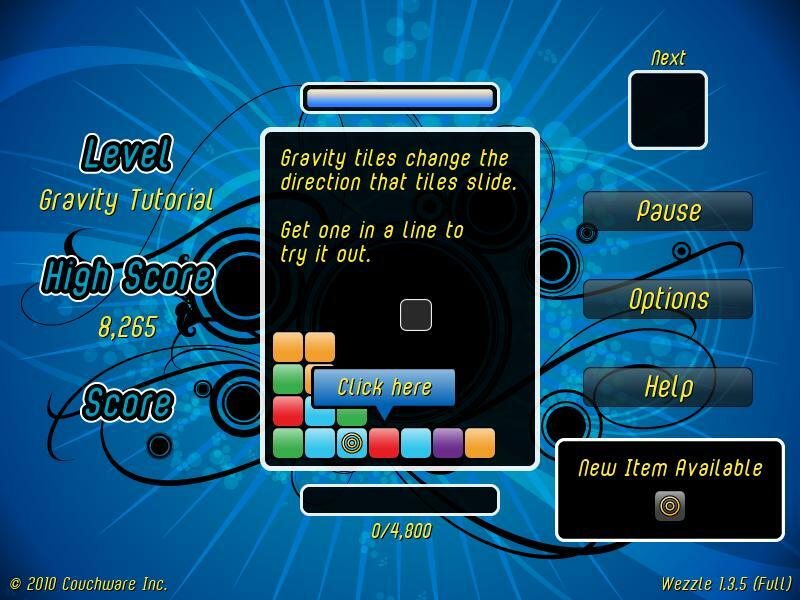 Together with other features such as the tutorial, achievements and a high score board, everything comes together in a very well presented package. I’d say it’s well worth the $4.99 (CAD) price tag for anyone who is into this genre but if you’re still not sure, you can get a free trial download which gives access to unlimited game play for one hour. Wezzle is available direct from CouchWare’s website for both PC and Mac. Get Wezzle here! A keen gamer since her parents bought her a NES at the age of 7, Zyle’s more recent gaming preference is for RPGs, Turn Based Strategies and Puzzle games. She’s pretty terrible at FPS and RTS but enjoys them all the same, and is currently avoiding MMOs due to a lack of time! Favourite game of all time: Ultima Online. For only £3 – this game seems like something worth purchasing for any fan of the genre. I like the fact that the developers offer a trial that doesn’t limit the game play. It essentially means a lot of people will just download it and play it for an hour – but those that appreciate the hard work of the developer will purchase it afterward. It’s a very honest approach in this day and age, that I find quite refreshing compared to the limited demos, trials, and draconian DRM methods some major publishers employ. I’d urge people to try the game – and if you like it, throw the developer your pennies. We’ve had a discussion with Couchware which revealed they are planning to move into a different genre with potentially a pretty exciting game, so they deserve the support. Stay tuned on that one, we know we will!